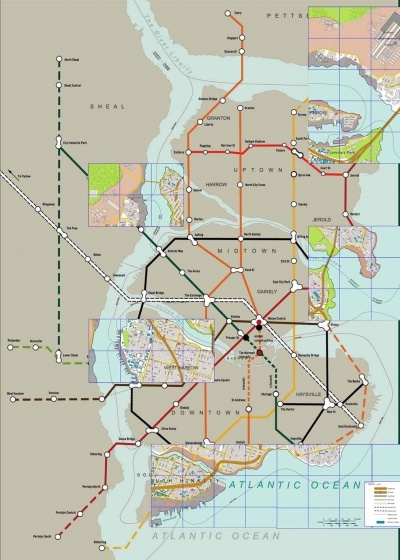 Gothamcityrail.com is the website for Gotham's railway system. Green Line service is closed between Prosper Street and Murtagh until further notice. Service between Murtagh, Haysville and Haysville South will continue on a holiday timetable during the week, and be closed on weekends for the duration of the reconstruction. Orange Line service is closed between Wayne Central and St. Andrews. The Narrows is closed until further notice. Service between St. Andrews, Dullich and The Docks will continue on a holiday timetable during the week, and be closed on weekends for the duration of the reconstruction. GCR cancels Dec 12-14 meetings on fare increases. Meetings will be rescheduled when full service is restored. 23rd Street station will be closed Sundays for renovation and repair. SmartTrip Cards now available in every station kiosk. Volunteers will have their names placed at the bus stop and will be able to assist the community by keeping the bus stops clean, accessible and free of debris. Great for church organizations! Service Note: Due to ongoing repair work on the system between Wayne Central Station and The Narrows Station, shuttle service will be running between Wayne Central Station and the Prosper Street Station where customers can use their transfer for service across the Rootsville Bridge. Thank you for contacting Gotham City Rail feedback. We take all comments seriously. Your comment will be screened and passed on for review to the relevant supervisor. Your comments help us improve. Gotham City Rail’s multi-million dollar renovation project is dedicated to giving Gotham citizens the highest-quality public transportation system in any major metropolis. Wayne Industries announced recently that due to routine technical issues, the GCR’s rebuild would be delayed by four - six weeks. GCR regrets the delay. - Students from Gotham’s Ravinia School in Gainley will be providing artwork for the Gainley Station between April 1 and June 1. Check it out! - GCR announces the purchase of 45 hybrid buses in fulfillment of the Mayor’s Clean Gotham pledge. To better serve our customers, GCR has completed its transition to a satellite tracking and communications system (STCS). Using cutting edge ultra high frequency technology, STCS will give GCR the real-time ability to track exact positioning of all its trains. This will allow for more accurate scheduling and should increase GCR's already impressive safety record. Chuck Craston, Sr. was discovered to be the real name of Batfan73 from Citizensforbatman.org's message boards. This would later be used to find an invoice on Maroniimports.com. After the countdown ended on Whysoserious.com/Overture, Gothamcityrail.com was "Jokerized," along with nearly every other website in the game. 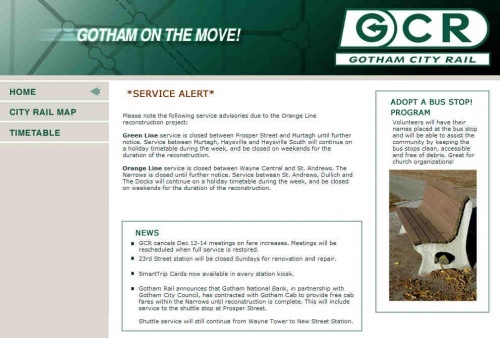 The Wayne Central-Narrows line being closed is a reference to Batman Begins, when a train heading from the Narrows to Wayne Tower was destroyed by Batman and Jim Gordon to stop the flow of the Fear Toxin. 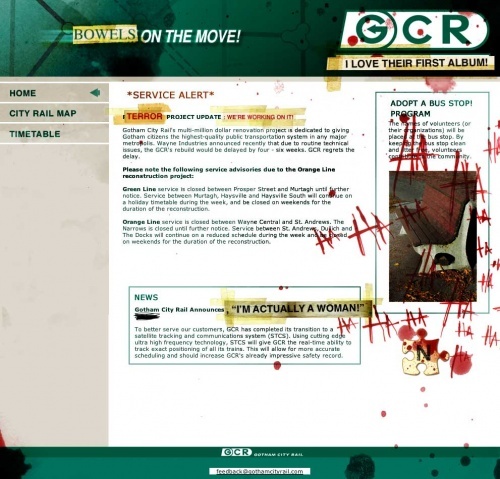 The webpage includes a large Gotham city map. Due to the service outages, timetable information is not available on this site. Please check your local station for a current timetable.